THE SALSA CONCERT OF THE YEAR, THURSDAY JULY 18. 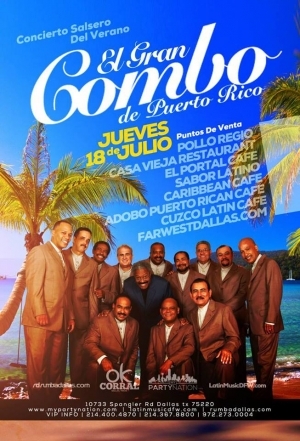 EL GRAN COMBO DE PUERTO RICO….LIVE!!!!! EL CONCIERTO MAS CALIENTE DE ESTE VERANO, LA UNIVERSIDAD DE LA SALSA, EL GRAN COMBO DE PUERTO RICO Y TODOS SUS EXITOS!!!! JUEVES 18 DE JULIO, DALLAS TX. BOLETOS DE PRE VENTA A SOLO $30, BOLETOS LIMITADOS. – POLLOS REGIO/TORTAS LA HECHIZERA.